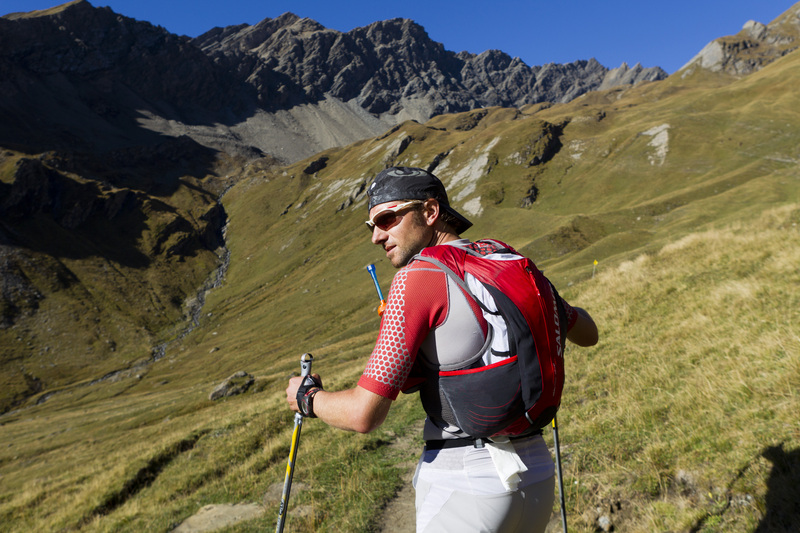 I have a passion for the mountain and for long trails which I use to do every weekend, and therefore during the summer period I often go out for several hours. Last spring in Nepal (Annapurna Mandala Trail) I trained myself for the distance and the altitude and at the start of the summer the Lavaredo Ultra Trail, the night trail and with “normal” nutrition: bread, Nutella, biscuits, cheese… I had (and will have also in the future) a great respect for the TDG, the unknown is around every corner, the important thing is to start without too many expectations and external pressures, try to enjoy yourself in each moment of the “journey”, feeling every sensation and letting yourself be surprised. What have you left the Tor with? An amazing memory and unforgettable moments spent in solitude and in the company of other athletes, the environment and the human warmth of the volunteers have left an indelible mark. During and after the TDG I met a lot of people and made several new friends, a sign that it is not only a competition but also an opportunity of to find friends. What I was able to experience and share will always remain and no one can take that away from me. How did you manage the problem of fatigue? I started with no timetable, therefore “à la carte”, the only idea was that by the first night I would have at least reached Cogne, I aimed to sleep for at least 30 minutes but after 15 minutes I woke up and then… away. The second night I tried to fall asleep twice, but I couldn’t and so I continued until at some point I forced myself to sleep at least 15 minutes. The third night I passed the check point and it was difficult for me to stop and so I continued to the bitter end… this however then led to what came next, the Malatrà. Was the race harder on a physical or on a mental level? On a physical level, unless you sustain an injury or major trauma, you can manage the pain in your feet (rubbing and blisters) and the muscle fatigue. The head must manage the physical problems but also the problems of fatigue, loneliness, hour upon hour thinking about what is left to do and what you have already done and always with the unknown possibility of whether you will finish it or not. Physically you are not pushed to your limits (although very close), mentally undoubtedly yes, probably also without taking proper account of what was happening in my head I surpassed what is mentally possible. How did you manage your recovery after the Tor? First of all I had 10 days of complete rest, to let my feet heal which were a little “harassed”, my knees were a little painful and undoubtedly my head needed to “switch off”. Having taken a week’s holiday, for the TDG I had a backlog of work in the office and with pleasure I also had several invitations to dinner from friends. Then I returned, according to the desire and the time at my disposal, to cycling and running in a very bland way. Tor, will you do it no more or try again and take back the victory? I don’t normally refer back to the races that I have already ran, I like changing, but the TDG has been such a beautiful and enthusiastic experience that I will surely re-do it. When? Mah!/I don’t know In any case it has to be re-done to review and greet all the volunteers on the course and experience again the warm environment at all the refreshment points (including the Bertone refuge). Register, prepare, participate, start and have the chance to cross the finish line, just this is already a victory and the most beautiful. Where you sore from the Tor? Was it difficult for you to return to normal life? I definitely think yes! The experience has been so strong that the memories are always with me, an hour never passes in which I don’t recall the adventure with pleasure. 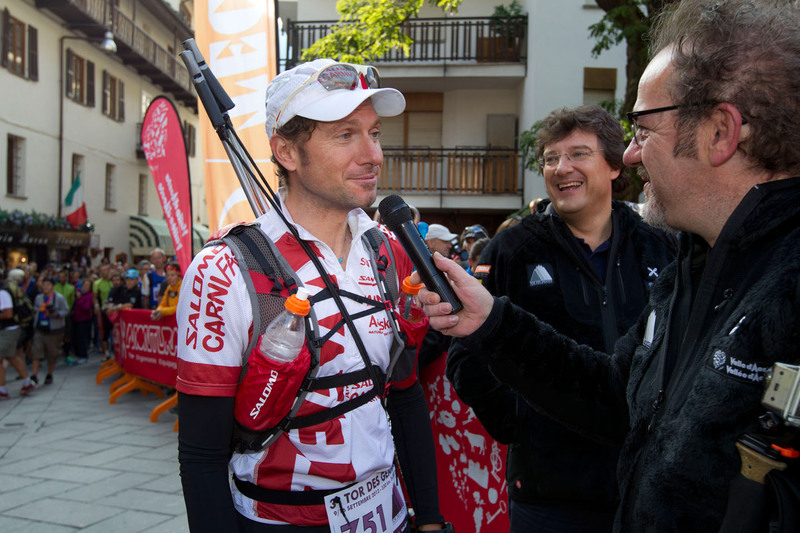 Physically it was not hard to return to normal life, it was harder on a mental level (especially the irregular sleep), partly because of what I was asked, reported and written about what happened at the end of the race. Those who saw you during the race remain amazed by your tranquillity, I have also seen the passage to Refuge Coda of Calvo Redondo and Le Saux, for them it was a stop of just a couple of minutes but you “waited for the pasta to cook” and you took all the time necessary to have dinner, is this perhaps the secret? Undoubtedly the fact of having met you was a truly an immense pleasure and therefore I was in no rush to recommence, actually. The Coda refuge finds itself in an absolutely beautiful place, mid- journey (166 km), and having arrived at sunset I wasn’t able to do a “hit and run”, I would have lost something special and unique and plus I would have missed out on drinking beer with friends! The secret? In 40 I won’t change the way in which I live out my passion for the mountains and the trail, the trail spirit will always stay with me… free./I will always be a free-spirit trailer. 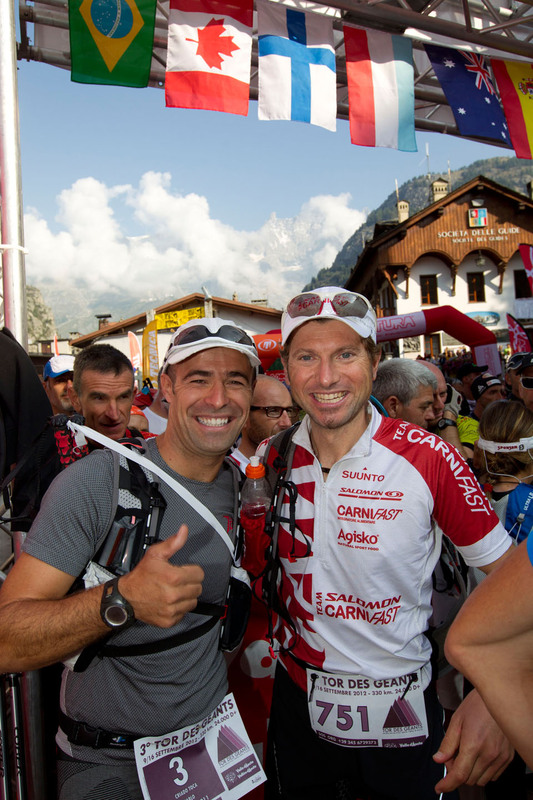 How do you explain the incredible time that took you from the Bonatti refuge to your arrival in Courmayeur? 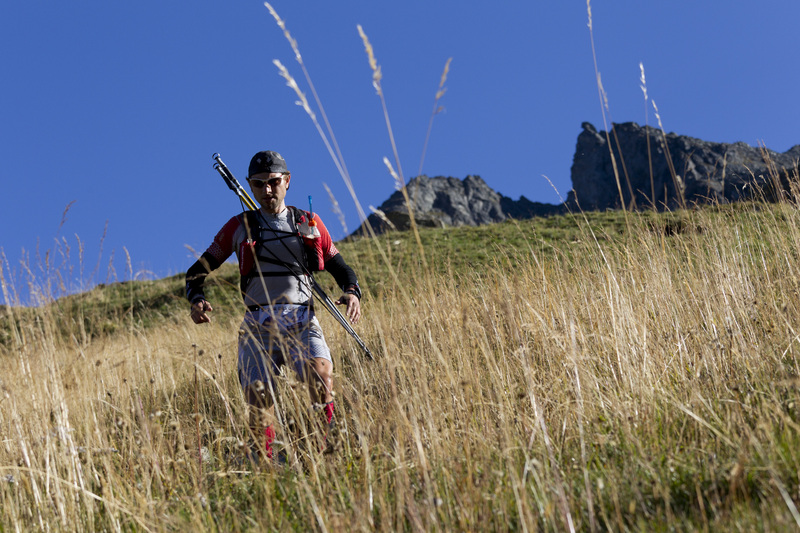 When you are in a panic because you are going the wrong way, your mind has no reason, the only point of reference is Courmayeur and you run, run like crazy, you ask several people and everyone tells you, “straight, straight along the river” and you run and run with a fury. You arrive on the asphalt and people in cars honk their horns and encourage you and you arrive more quickly. Several people coming from different points of the Val Ferret confirmed that they watched me running… and not just a little. Perhaps those who participated in the TDG noticed only this detail and not the 75 hours spent in solitude with no support, external assistance and sleeping just 30 minutes over three nights. I would be pleased and I hope that all the speculations and various conjectures made towards the organisation and on my person are ended, so that one can continue to look at the true essence of the trail: nature, friendship, sharing, pleasure and enthusiasm. The beautiful things experienced during the TDG are the details that only the participants of the TDG live. And no one can take them away from us. 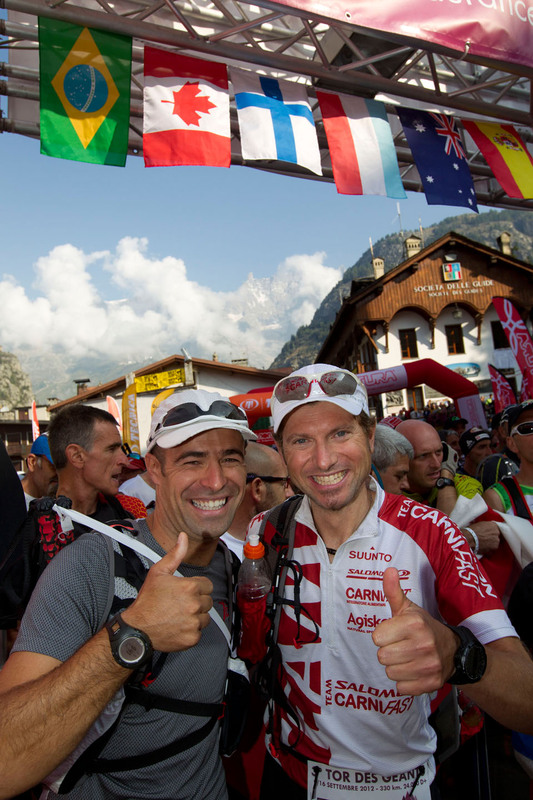 THANKS to the organisers, to Alberto the President of the TDG, the tireless volunteers who spoilt us with refreshments, to the trail enthusiasts who encouraged us, to all the smiling participants and to all the new friends of the Aosta Valley.